A must have for any serious bow hunter’s toolbox – The Bow Trainer is a simple way for you to keep sharp in the off season, improve draw stability and increase your draw weight! Become a better hunter today! Many factors can disrupt an archer′s ability to train consistently during their off-season. When their competitive or hunting season arrives, they pick up their bow and find they′ve lost some strength. With less strength and less stamina their accuracy suffers. It′s human nature. 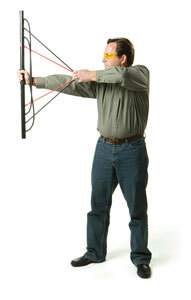 With the Bow Trainer program archers can train almost anywhere for optimum strength and accuracy. And since the Bow Trainer is easy to store, and it comes with a detailed user manual and online training program, participation and success can begin immediately and continue all year long.